This unique image of America’s greatest ballpark Wrigley Field is a true work of art. Original photograph taken on Opening Day 1996. The emulsion layer of the original Polaroid photograph was hand-manipulated to achieve a truly remarkable poster with an “oil painting” look. This is not the creation of a cheesy filter in some computer program. No, this is a hand-worked photographic art piece. The emulsion on the surface of the original Polaroid is pushed about using a variety of tools to sculpt and form the photographic image. No paint or ink is applied. This image is exactly as the original looks. This is not a mass-produced poster, either, when they’re gone, they’re gone, so get one while they last! Whether you are a Chicago Cubs fan or not, this unique poster is for you if you are a baseball fan! 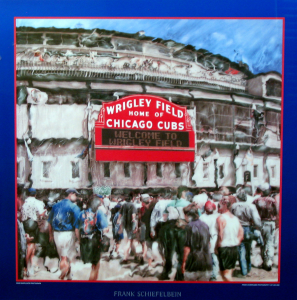 Makes a great gift for the baseball or Chicago Cubs fan. I got this for my husband’s office and love it.